National Geographic Encounter: Ocean Odyssey is an attraction in Times Square, New York. Using ground breaking technological techniques you are virtually transported into the depths of the ocean. Encounter sharks, whales, giant squid and sea lions face to face, without even having to get wet! The underwater world is the creation of the Oscar and Emmy Award winning team responsible for Game of Thrones and Martin Scorsese’s Hugo. So, that’s definitely a guarantee for great visuals! 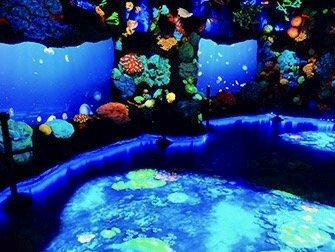 National Geographic Encounter: Ocean Odyssey is a huge 5,500 square metre attraction that can best be described as a virtual aquarium. It starts by immersing you in the images and sounds of the ocean. You walk through various habitats, each with it’s own environment and also, inhabitants. The Encounter also offers a digital ‘playground’. Here, you can play with holograms, touch screens and more. In addition you learn about the conservation of the ocean and, most of all, the scientific research that goes in to it. The use of advanced imagery and sound technology throughout the experience makes it seem like you are really under water, standing face to face with ocean life. 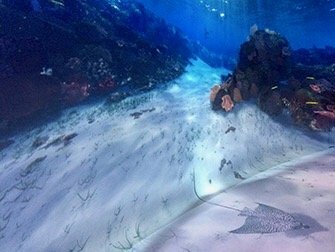 A visit to National Geographic Encounter: Ocean Odyssey takes around 90 minutes. 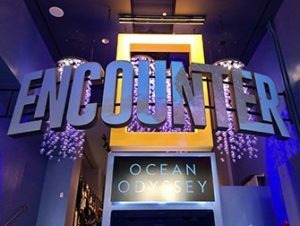 Eric’s Tip: National Geographic Encounter is a beautiful attraction, especially if you are with children or have a specific interest in marine life. If you have a rainy day and are in the Times Square area, you should definitely pay a visit here. Age: due to the intensity of the experience, the encounter is less suitable for children under 6 years.